The attic is a crucial area to examine during a home inspection using reliable property inspection software. This area of the house is often unchecked due to its concealed position. Nevertheless, you should know that the condition of the attic may give valuable insight to the actual condition of the whole property. It can provide clues to pressing problems that might not even be known by the current occupants of a house. Even if the roof may seem intact, you may still find broken trusses or rafters inside the attic. This would mean that the structure underneath the roof may have already dilapidated to an extent. Other warning signs to pay close attention to are stress cracks that could signify the loss of integrity of the upper portion of the house. By clearing up whatever damage that could be found among the supporting structures of the attic, you may be given peace of mind that your roof won’t cave in at any given moment. They say that an attic reflects the history of a house. It can in fact pinpoint fire damage that has happened in the past. Inspectors are well-acquainted with the fact that if the wooding found in the attic is black, scorched, or sooty, that the house must have burned down previously. The eyes of a professional can also determine if burnt flooring in the attic has been painted with another color to mask the defect. This can be easily noted in mobile devices with property inspection software during house examinations. Insulating your attic is an important step to preserve heat during the cold months. 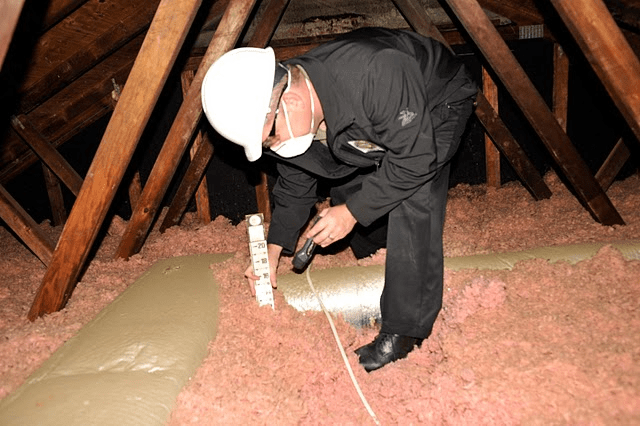 During a home inspection, there may be defects noted with insulation such as fiberglass batts facing the wrong direction. Also, make sure to ask your inspector if the insulating factor in your attic is up to par. Attics are prone to water damages due to the top down nature of water flow. Relatedly, you should be wary of water seeping in through roof leakage or penetrations. Condensation can also form around pipes that may cause the wood to rot. If you find any water problem in the attic, there is a good chance that other areas in the house are faced with the same problem. It is your responsibility to correct the root of the problem immediately since water leaking has a gradual effect that gets worse over time. The presence of rodents in your attic means that the integrity of your roofing and walls is affected. Squirrels, raccoons, and other animals usually enter your attic through loose boards and holes. If your inspector finds tiny pellets or droppings on the floor, he will have to determine the entry point of such rodents. Although pests may seem harmless, they can actually make considerable damage in your attic by chewing on soft wood and the wiring found under your insulation. Try to look for a long-term solution and consult animal and pest control companies whenever necessary.